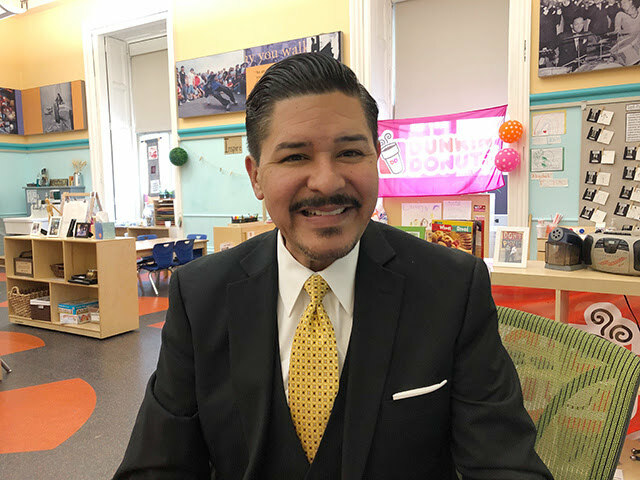 It’s been one year since Richard Carranza stepped into the job as leader of the country’s largest public school system. Since he arrived as the mayor’s second-choice guy, Carranza has made his mark. He’s leaned into tough conversations around race and equity and tried to reorganize the massive bureaucracy that serves more than 1.1 million students and has added essentially two more grades with pre-kindergarten and programs for three-year-old New Yorkers. To mark the anniversary, WNYC’s Jessica Gould talked with him about his accomplishments and how to move forward, especially on the issue of better integrating schools and classrooms. The following interview is edited for clarity and length. What is your vision of what real integration would look like in New York City public schools? I think in New York City’s public schools we have such a rich portfolio of opportunities of schools. And my vision is that a public school student in New York City really has options that are not limiting to them. Unfortunately in New York City we have a series of screens, we have a series of things that limit the options that children and parents have. And I think that we need to work on removing those options. And there are folks who say, “Well, you have control, just take them away.” It’s not that easy. I think you have to engage communities and some of those are very difficult conversations. But you have to engage the community so that even if there’s not agreement there is at least understanding why it’s it’s of such importance to take on that kind of work. That’s the work that we’re engaged in. And as I reflect on my first anniversary here in New York City there are some people that would have liked us to go a lot faster and there are some people that are saying “Wait, you’re going too fast.” What we want to do is we want to do it right. Tell me a few concrete steps of how to get there. I think you have to have a conversation about it; it never works when there’s an imposition of any kind of a system by anybody in authority. The good news is that there are multiple community districts across the city that are having those conversations. District 3 has done an incredible job of really taking on the issue of diversity in their schools. District 15 has taken on the issue of screens. There are about another eight districts across the city that we know of that are having these kinds of conversations. And we know because we’ve actually invested some resources to have the engagement process help those districts to get voices at the table. We have a community wide diversity advisory committee that has given us their first series of recommendations. The mayor and I are actively looking at the recommendations and we’ll be coming to the table around those that we can implement now or very soon . There are a number of initiatives including a lot of work that we’re doing around curriculum to make sure that the curriculum is culturally relevant but also academically rigorous for our students. We’re taking a deep look at our gifted and talented program. On specialized high schools, Mayor Bill de Blasio recently acknowledged that he should have done more to engage communities on his proposal to eventually eliminate the Specialized High School Admissions Test (SHSAT) and admit top students to the specialized schools from schools across the city. What do you think should be done going forward to engage those communities including the Asian American community where some critics are? So I give the mayor lots of credit. I think he is introspective and I’m going to give him a lot of credit for saying that. That being said, we could always do more engagement to that end. We have now visited every one of the 32 Community Education Councils, we’ve done a presentation, and we’ve answered questions. We’ve gotten feedback in every one of those communities. I personally have met with a number of groups, including some groups that are very closely affiliated with the Asian community. We’ve engaged with elected officials from all across the city and from across the state. Even some of our federal elected officials. What’s interesting is that whereas not too long ago folks would have said, “This particular issue is dead in the water,” this legislative session we now have the speaker calling for hearings. We now have the senators saying that they want to have hearings. You have the speaker of the city council saying he supports the mayor and my plan to eliminate the test. So there is much more momentum. That being said, you know these are going to be tough conversations and it’s going to really call on us to determine where do we land, where is our moral compass, understanding that some communities have very strong feelings about this. I’m very buoyed by what’s happening now and I’m excited to have that conversation. If anyone can have this conversation and actually get to a solution, it’s New York. There seems to be a third option emerging, which is not keep the test or eliminate it, but find a better test. Do you think the SHSAT is a bad test and could it be replaced with a better one? I think the SHSAT is not a particularly useful test for identifying students that have capabilities of being in a specialized school. It doesn’t necessarily identify the grit or the hidden tenacity or even quite frankly the skill sets that you need to be able to write well or read well or to think logically. You literally have to learn how to take that test. That’s not a good test. So is there room to look for a better instrument? There could be, only if that is part of a broader portfolio of other metrics as well. You cannot discount grades. You cannot discount attendance, you cannot discount what we ask kids to do every single day in their middle schools. And that’s why I think the proposal we’ve put forward where that’s taken into account has to be part of what we look for in identifying opportunity for students in these schools. What is a culturally responsive curriculum? If you look at a history book, do you see yourself in the history? I know that growing up, my stories are replete with my uncles, my older uncles, who went off and fought in World War II, fought in the Vietnam War. I know that I have uncles and aunts that worked in aircraft assembly plants. Do I see them in my history book or when I read a novel? Do I read novelists that share my cultural background and their cultural backgrounds. Is the perspective that I’m learning about just a Eurocentric perspective or is there room for other kinds of perspectives? Do they have an LGBTQ perspective? These are all the things that students bring into the classroom every single day. So the curriculum, what they read, what they study, who they learn about should be reflective of the rich diversity that is America. Does that mean new books are coming to all the schools? Well, you know books are important but also websites and artifacts and supplemental materials and experiences and art museums and tours. It means all of that. But the good news is that we’ve already put out an addendum to all of our base goals in social studies where we have different kinds of authors from different backgrounds. I wanted to ask you about some specific student proposals on this subject [of integration]. I was at a community meeting last week where there was discussion from some Eleanor Roosevelt [High School] students who were talking about getting rid of screens and also getting rid of district preference. What do you think about that? I want to learn more about what they’re proposing. It’s not the first time I’ve heard some of those ideas but I understand that students have proposals. Look, if you want to change the world, listen to the students. Talk about first-person constituents. They are in the classrooms, they are in our schools. So I am always very interested in what our students have to say. Similarly the group Teens Take Charge. They have their proposal about academic diversity. What do you think about that? Again, I want to know more about what does that look like. One of the things that I’ve enjoyed in this first year here in New York City is spending a lot of time with groups like Teens Take Charge, IntegrateNYC, and my own chancellor’s Student Advisory Council. They’ve done their homework. [They are] very articulate young people that have some real ideas about what this should look like. So I want to learn more about what they’re proposing and then see how that becomes something that perhaps we pursue. Speaking of tests, top of mind for many students and parents this week, I got a lot of responses on Twitter when I said that I was going to be seeing you: “Ask him why there’s so much testing.” To parents who are determined to opt out or interested in opting out, what would you say? Well, you have to know how your students are doing. The state of New York has an assessment. When people say, “Why should we do the test?” It’s the law. There is a law. Now, parents have the right for their students to opt out of the test. That’s not a secret. But I do think it’s important information for parents to have. How is my child doing in this particular grade? Have they mastered the state standards? Can tests get better? We can always make them better. We’re working very closely with the state education department. We have teachers from our system that are on advisory panels that are reworking these tests. You know people want us to go out in the middle of the street and have a street fight about these issues. It’s not the way I do business. So we’re pushing back where we need to push back. But my message to parents is this is good information for you. Help us by making sure your students don’t feel the stress. They need to relax. They need to do their best. They need to make sure they have a good night’s rest. It will give you some information that’s actionable. But again it’s only one of many things that you need to look at to see whether or not your student is doing well. Another specific question: on school safety. I know there’s an agreement between the police department and the DOE being worked out over the role of security agents in schools. Can you tell me where things stand with that and why it hasn’t come out yet? It’s imminent. We’re two big agencies, NYPD and DOE, and there’s lots of t’s to cross and i’s to dot. So it’s imminent. Now the whole issue of security, and I said this in my City Council testimony, the issue of security is not an issue until God forbid something happens. And then people want to know why isn’t there more security. I want to make sure that every one of our schools is secure. I don’t want teachers to be the security force of our schools. We have to have security agents. So we work with the NYPD and we’ll continue to work with the NYPD. We want to make sure we have safe and secure facilities with entrances and exits—and then we want to make sure that the important security happens in the creation of an environment in the school where students feel safe, they feel supported. Parents want their children to be safe in school. And we do too. I’d love to know the defining moment in your education. What moment in your education changed your life? That’s hard. But I would have to say going back to kindergarten. I started in public schools as an English language learner. I only spoke Spanish. And I remember my kindergarten teacher, to this day, when I walked through a department store and smell that perfume, I recognize it because Mrs. Ellis who seemed like she was seven feet tall, this huge smile, these big beautiful arms, this, big beautiful African-American woman would hug me and say, ‘Baby it’s going to be OK.’ Because I didn’t understand a word that was being said. Yet I knew that I was in a safe place. And I learned English. That was transformative for me because school could have been a very hostile environment for me. But I remember feeling so warm and accepted and loved. And I remember Mrs. Ellis. I still remember to this day. When I smell that perfume, I think of her.